My dad Walt Herek worked as a salesman for this company back in the mid 1950's in Omaha, NE. I remember the big chicken on the car! 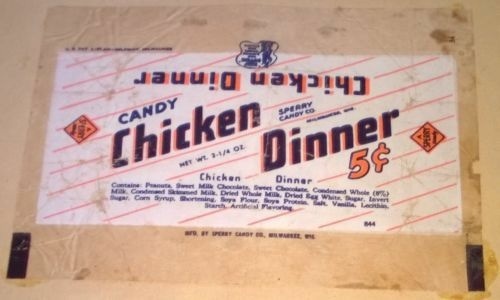 and the big box of chicken dinner candies behind the door! Great memories! A strange name for a candy br that I have fond memories of. I can still hear their TV commercial singing, "Chick, chick, chick, chick, chicken dinner." It's been over fifty years.